The first thing you want to do is mount the frame on the boot and lightly tighten the bolts. 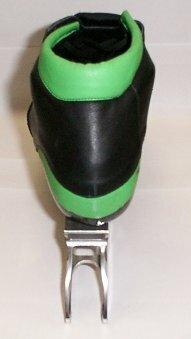 Second is to center the frame with the back of the boot (see below). Not like this (see below). And not like this (see below). Here the frame is in the center in the back and toed in a bit in front (see below). Here I'm putting a leather tab (tabs are 40 thousands of an inch or 1 mm thick) on the bottom of the boot next to where the frame meets the boot. These tabs are put on the outside of the boot and frame, not the inside (see below). Tabs can be cut out of a leather work glove that can be found at a hardware store for $1 to $5. Now loosen the front of the frame and slide the front tab (if you need two tabs put one on top of the other to double the thickness) between the frame and boot until it is flush with the frame. Now tighten the front bolt and then loosen the back bolt and again slide the back tab between the frame and boot until the tab is flush with the frame (see below). While doing this try not to move the frame from the center in back and toe in position you initially set the frame at. This is where the tabs would be positioned if you took the bolts out of the boot and lifted the boots up off the frames. As you can see the tabs are positioned on the outside of the frames (see below). Ok, that's how you tab the boot now let me go into why your tabbing them. This is looking at the Verducci boot from behind. As you can see the frames are coming off the bottom of the boot in a pronated position. If you try to skate on the boot this way chances are the boot is going to pronate (boot will fall to the inside). The Corsa's have been coming with 1 degree of pronation on each boot. What we're doing when we tab the frame is to get the frames to come square or straight off the bottom of the boot. 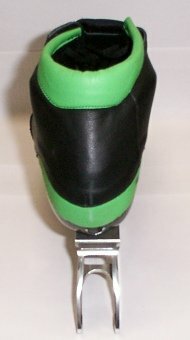 With the boots having 1 degree pronation we need only 1 tab to get the frame square with the bottom of the boot. This is what the boot should look like after tabbing (see below). Now you can do this a couple of different ways. 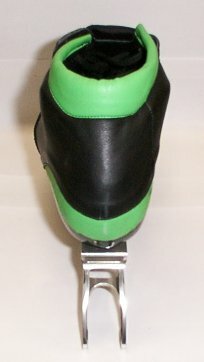 You can put the frame on and center the back on both boots and toe in the front a bit with no tabs and try to skate on it like that. If your pronating on one more than the other boot then first try to toe in a bit more on that boot (you can toe in more on the Corsa than most boots so don't be afraid to toe in quite a bit). Always try to leave the back in the center. If toeing the boot in doesn't stop the pronation next move the front of the frame back to only a bit toed in and add one tab to the front and back of the outside of that boot and try it again. If that's not enough then toe it in a bit again and try again. If that's not enough again move the front of the frame back to only a bit toed in and put a second tab in and try again. If that' not enough then toe in a bit again. You don't want to use more then 2 tabs on a boot (4 all together 2 front 2 back). The other way to do this (the way I like it) is to right from the start center both frames in back and toe them in a bit in front and put 1 tab in front and back outside of left boot and put 2 tabs in front and back outside of right boot. Then use the toe in to fine tune falling in or out on the boot, if you toe in more you will fall out more and if you move the frame out more in front you will fall more to the inside (pronate).